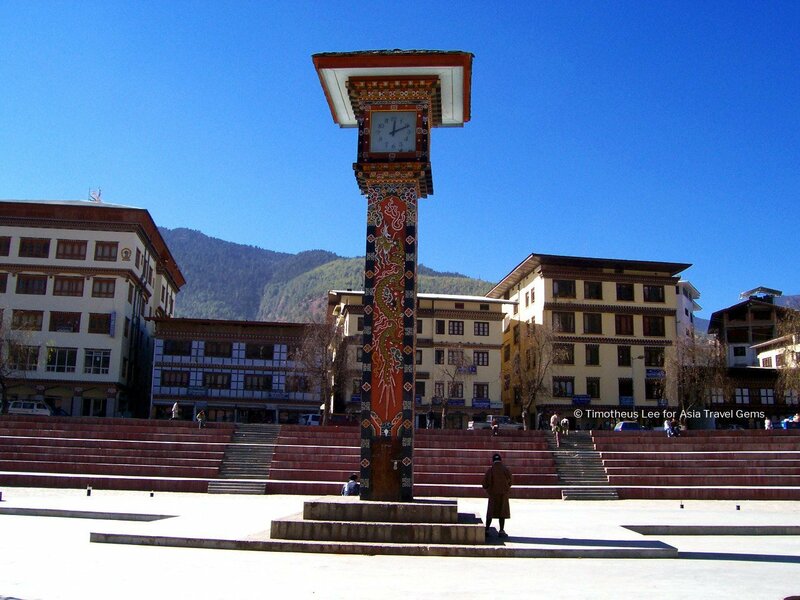 Off the Main Town, alongside Thimphu River known as Wang Chhu, is one of the Best Places To Visit In Thimphu Bhutan. It is known as Tashichho Dzong. You can drive there or take a healthy and scenic walk to this fortress monastery that is now the seat of Bhutan‘s government. It is in the same direction as towards Radio Tower, or the National Preserve where the Takin is, but instead of going up the hill, you walk down towards the valley. As my friend and I walked towards the bottom of the valley, we came across a cluster of houses that looked the same, with the same green roofs. My friend pointed them out to me, and told me in a matter of fact manner that those houses are Bhutan’s version of Singapore’s HDB. (HDB stands for Housing Development Board, and they build government public housing). 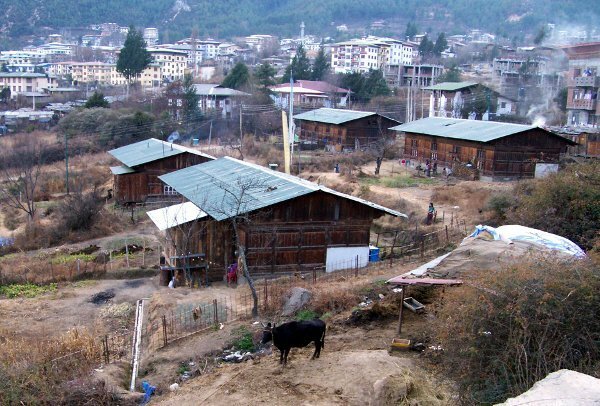 In Bhutan, a family is given a house (one of those buildings with the green roof, photo above), and a plot of land. The land was for them to farm and raise animals such as cows. With the harvest and animals, they can feed themselves and make a decent living by selling any surplus at the markets. Great idea. But my friend shared with me that it may not be working out. We continued our trek downwards. It was beautiful with lots of green trees and fresh air. Very invigorating! Shortly after, we arrived at a part of the mountain that had a splendid view of the entire valley and Tashichho Dzong. Tashichho Dzong is a fortress monastery on the northern edge of the city. It was built in the 17th century. The structure has been the seat of Bhutan’s government since 1952. Below is the view of Tashichho Dzong from another angle. 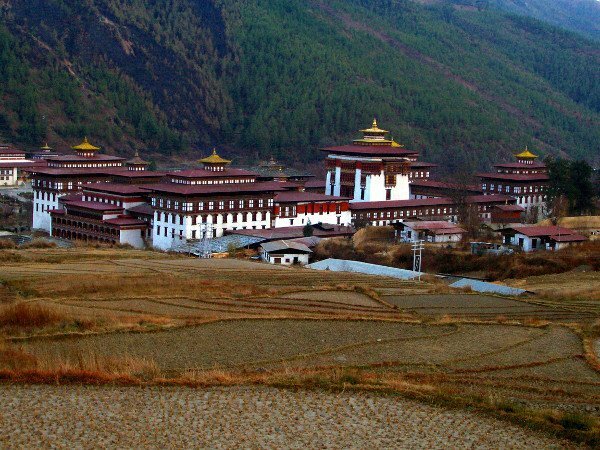 Each district in Bhutan has a type of fortress known as the dzong, which also served as the religious and secular administration for that region. In Thimphu, this fortress was Tashichho Dzong. 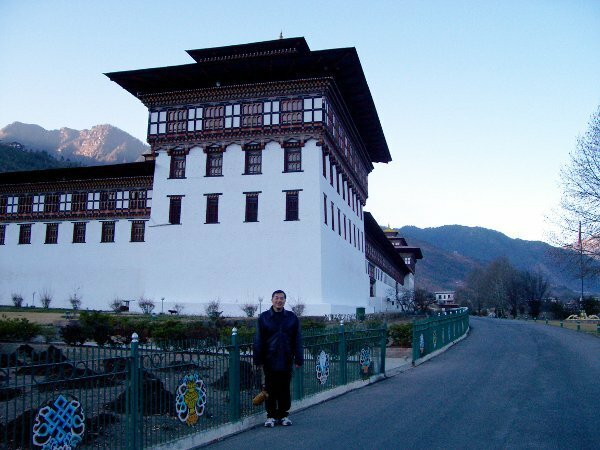 Some sources said that Tashichho Dzong was built in the 17th century. Some said 18th century. 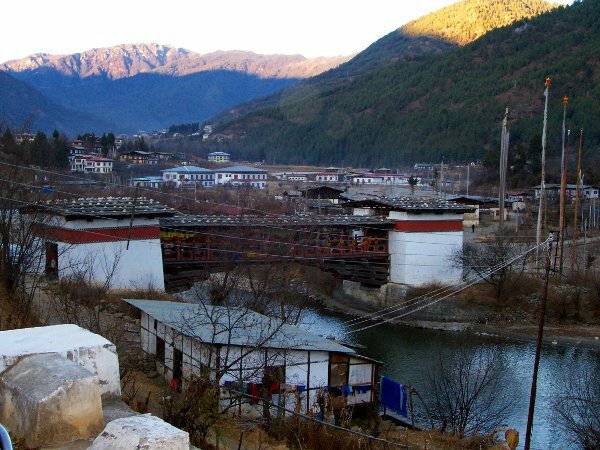 Some even claimed that a dzong existed in Thimphu since the 13th century, but never gave specifics if it was Tashichho Dzong. Originally built as a fortress with a monastery within, whenever it was actually built (what’s a hundred or a few hundred years difference eh? ), the fact is Tashichho Dzonghas been the seat of Bhutan’s government since 1952. Hence, there is high security measures outside, around and inside this important building; such as gunmen outside the dzong, guards at the entrance, and watchful eyes everywhere at Tashichho Dzong. 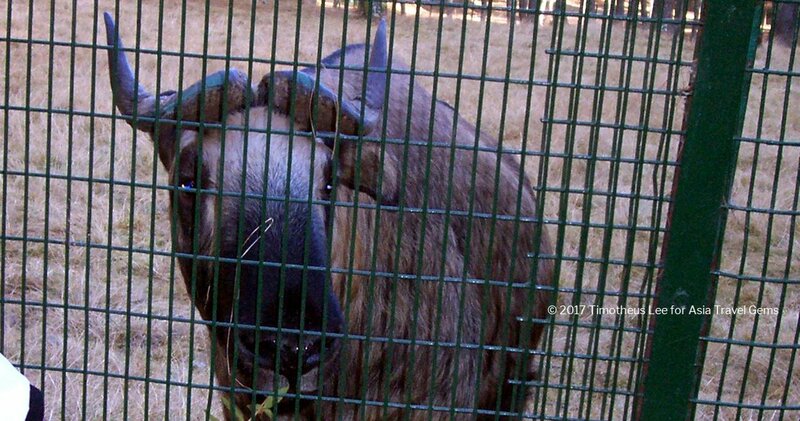 As we walked from the car park to the main entrance of Tashichho Dzong, my friend’s behavior changed a little. He switched from a relaxed and casual demeanor to a more serious one. He cautioned me to follow his lead. There are rules, regulations and etiquette to follow when one visits Tashichho Dzong. Outside, on the grounds of Tashichho Dzong, the soldiers who stood guard suddenly became alert. My friend noticed the sudden tension in the air. He looked around, and urged me to stop, stand still, and lower my head. I did as I was guided. A dashing man of obvious stature walked by. “Good afternoon, Sir.” my friend greeted the gentleman, whom I later learned is one of the knights of the kingdom. The handsome knight smiled, and answered, “Good afternoon.” as he walked on. I was struck silent in awe. I have finally met a knight! In person! Wow! After the knight passed by, my friend explained to me that it was customary or people (locals and foreigners) to show respect to the knights and politicians in Bhutan. The standard way is to stop in our tracks, stand very still, and lower our heads with respect when a knight or politician walked or drove by. The etiquette when in the presence of royalty was even more strict. One would be expected to move to the side, stand very still, lower one’s head, and not speak unless spoken to. It was frowned upon should one dared to glance up and steal a look. The guard made a thorough check of the letter, our belongings and us, and we were allowed to enter. After this point, no photo taking or video shooting was allowed. So I have no photos to show of my time inside Tashichho Dzong. There were many people who attended this special festival. Look at that large painting on the wall! It looked amazing and colorful! Tashichho Dzong also hosts Tsechu, a colorful masked dance festival, at the end of every summer. While such festivals are popular with tourists, one must remember that these festivals are not held as tourists attraction. They are genuine events manifested from thousands of years of religious traditions. Outsiders like you and me are very honored to be given the privilege to attend and witness it. 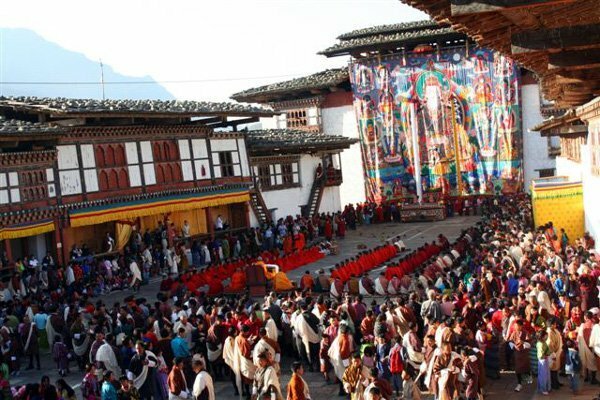 Should you ever visit Bhutan and attend such a festival, please remember that, and please remember to be respectful, and listen to the instructions from your guide. While it is true that there will inevitably be lots of socializing, more importantly, it is an occasion for prayer and blessings. Every Dzong has images of Buddhas and Bodhisatvas. Whenever people visit, whether during a festival or not, they take the opportunity to pray and ask for blessings for themselves and their loved ones. 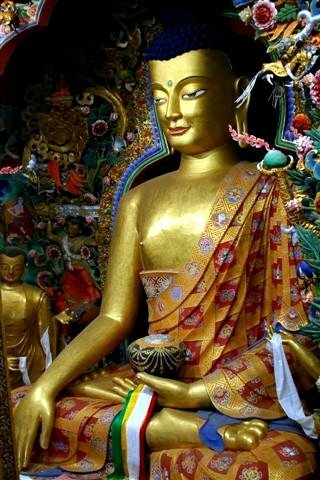 Coming back to the Tshechu, it is a festival honoring Guru Padma Sambhava, “one who was born from a lotus flower.” This Indian saint contributed enormously to the diffusion of Tantric Buddhism in the Himalayan regions of Tibet, Nepal, and Bhutan etc. around 800 AD. The festivals take place on or around the 10th day of the month according to the Bhutanese calendar. Thousands of locals dressed in all their finery, some of whom traveled for days, attend these Tsechus as it was believed that everyone will gain merits by mere presence. Better when one participated. 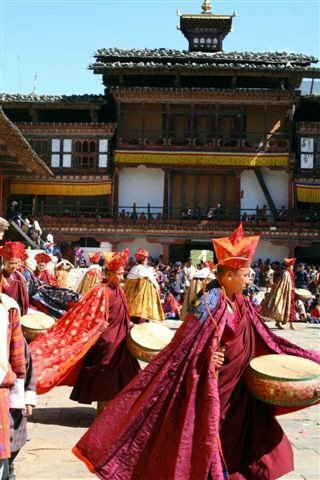 Hence, it would be no surprise to see laymen as well as monks perform in the mystical masked dances (known as Chaam) accompanied by traditional Bhutanese music. Alongside Tashichho Dzong flows the Thimphu River known as Wang Chhu, or Thimphu Chhu. The river separates the east and west of Thimphu valley. A couple of hundred meters away from the main entrance of the dzong was an ancient bridge that connected east and west Thimphu. It is one of the remaining cantilever bridges. When you visit Tashichho Dzong, do ask to see the Cantilever Bridge (if you guide does not do it or if it is not in your itinerary). It will be an amazing experience, I promise you. 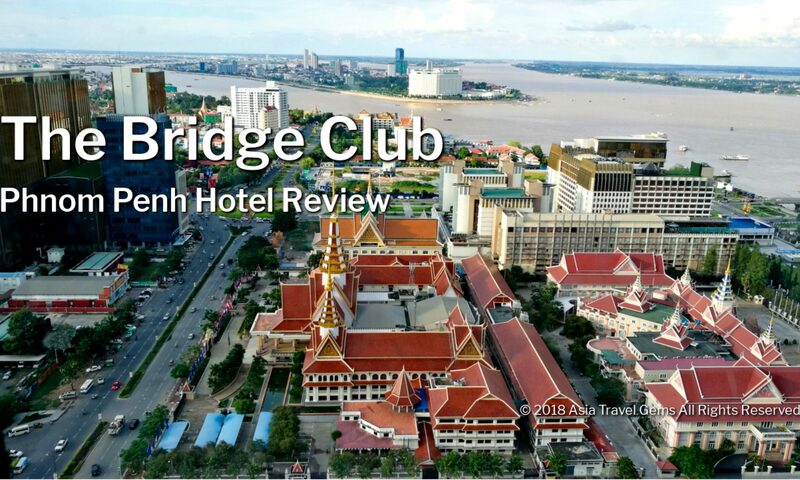 The bridge is truly an elegantly crafted structure. Built during ancient times, it is truly an engineering marvel. It is still so sturdy after all the years. On the bridge, there are lots of prayer flags. These flags are almost everywhere in Bhutan. And they really add so much color to the city. 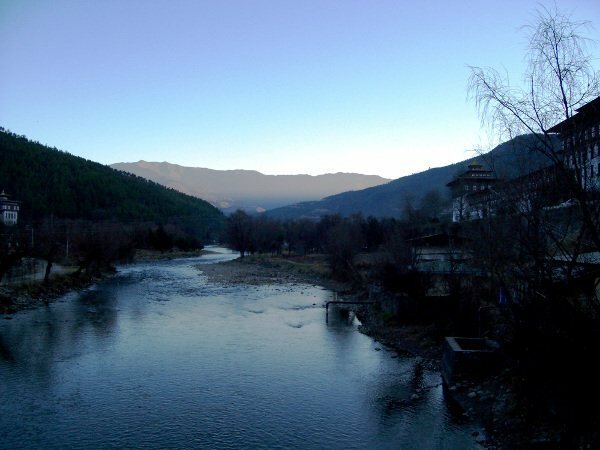 When you stand on the bridge, and look out back into the main town of Thimphu, you can enjoy a breathtaking view of the Thimphu River, also known as Wang Chhu. The waters flow gently towards the point where two mountain slopes meet. Thimphu, as always, is so serene and quiet that you can hear the lilting sounds of the flowing water very clearly. The entire scene composes into a masterpiece image that will remain in your mind forever. Below is a video taken from the cantilever bridge of the river. On the right, you can see Tashichho Dzong. On the left, for a few seconds, you can see one of the royal palaces. I hope you enjoyed this post as much as I enjoyed sharing it. 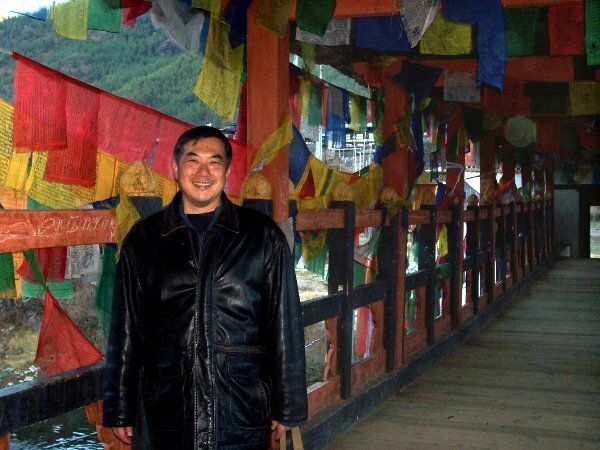 I love writing these posts as they remind me of the time in Bhutan. I truly had a fantabulous time! 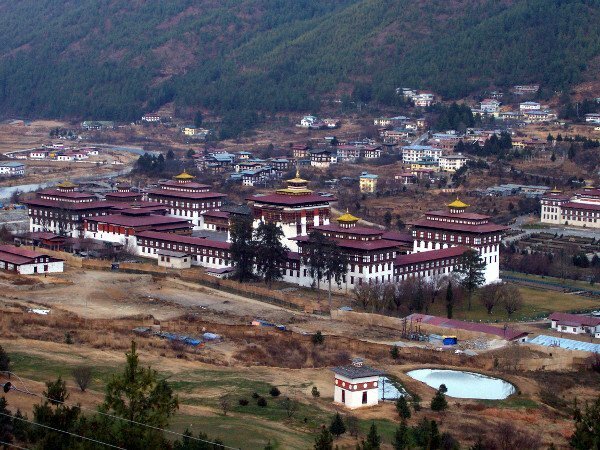 If you have ANY questions about this article, about Best Places To Visit In Thimphu Bhutan – Tashichho Dzong, ANY at all, please submit your questions as comments below. I will be happy to help you out. 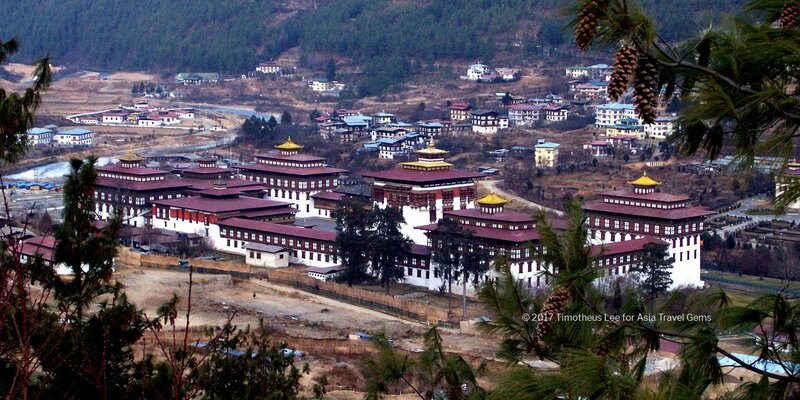 Hi there thank you for this great place, Thimphu Bhutan Tashichho Dzong looks like a great place to visit. I have never been to Asia, are there any other great places you would recommend me to visit? Thanks for dropping by. And thanks for your nice comment. Bhutan is indeed a fantastic place to visit. You must try to go there one day. There are many more really good and interesting places to visit in Asia. Singapore is one of them. I am in Singapore … haha. Another is Indonesia, Thailand, Hong Kong, and many more. I will be writing about these places too, and update the site with more best places to visit in Asia. Please sign up for my newsletter to get updates. Thank you for the reply! I have heard many great things about Singapore, Thailand, and Hong Kong! I love to visit cities with great food, nice beaches, and a moderate temperature! You are in for a treat! My next post will be about Singapore. Do look out for it. I will be sharing my experiences. And even featuring places that are really nice but few people know about. I will be doing the same for the other cities that will soon be on this website – Hong Kong, Thailand, Vietnam, Indonesia, Malaysia, and more. All with great food, nice beaches and moderate temperatures, too. WOW. What an amazing article! I want to travel one day, and it looks like I know where I’ll be going first! The Timphu river looks like a great place to visit. I watched the video and I like what I see. Although Tashichho Dzong looks like another great place too. Yes, you must visit Bhutan some day. It is truly a paradise on earth. And do visit the other places I mentioned in this website too. I’ve never travelled to Bhutan and it looks like a fascinating country. It’s interesting to note that each family in Bhutan is given a house and plot of land. I’m curious to know why it isn’t working out for them. Thanks for dropping by Yvonne! Oh, you will love Bhutan. It is truly the last shangri-la on Earth. I’m not sure why it is not working. Sorry I am unable to provide info about this. this place is nice, I have never visited this place before, hope that I have chances to visit there one day and experience the culture there, should be feel great! Thanks for sharing! Thanks for dropping by Dino! I’m sure you’ll love Bhutan. It is truly the last shangri-la on Earth. The culture there is very rich. Lots to see and experience. Pls do read our other posts about Bhutan and Kuala Lumpur. In time, we’ll share more about other cities such as Singapore, Hong Kong, Vietnam, Indonesia, and more! Thanks for this great article you shared. Hope to visit this place some time. Great job. Welcome Andrew. We are glad you enjoyed this article. Please do explore our website and read the rest of the articles. Also, do subscribe to our newsletter to get updates. Previous PostPrevious Asia Travel Gems Wishes Everyone A Happy Chinese New Year of the Fire Rooster!